The Land of Lincoln is one of only seven states to impose harsh restrictions on the sale and possession of fireworks. Fireworks are a staple of America’s celebration of its Independence Day. But good luck buying any in Illinois. For yet another year, the Land of Lincoln is one of only seven states in the country that doesn’t allow the purchase of consumer fireworks. Illinois’ Pyrotechnic Use Act bans the sale, possession and use of those “consumer fireworks,” including bottle rockets, roman candles and firecrackers. The lack of enforcement of the law, which carries a punishment of up to one year in prison and a $2,500 fine, is laughable. Communities from Elgin to Effingham will be filled with the same rockets and red glare as towns in other states across the country. What isn’t so amusing are the parking lots of fireworks stores in Wisconsin, Michigan and Indiana that are filled with Illinois license plates. The money Illinoisans spend there could be used to create jobs and raise tax revenues in the Land of Lincoln, where the General Assembly has failed to pass a balanced budget for the 16th straight year. Indiana has gained about $2.5 million in tax revenue every year since it loosened fireworks laws and leveed a 5 percent fee on sales in 2006. 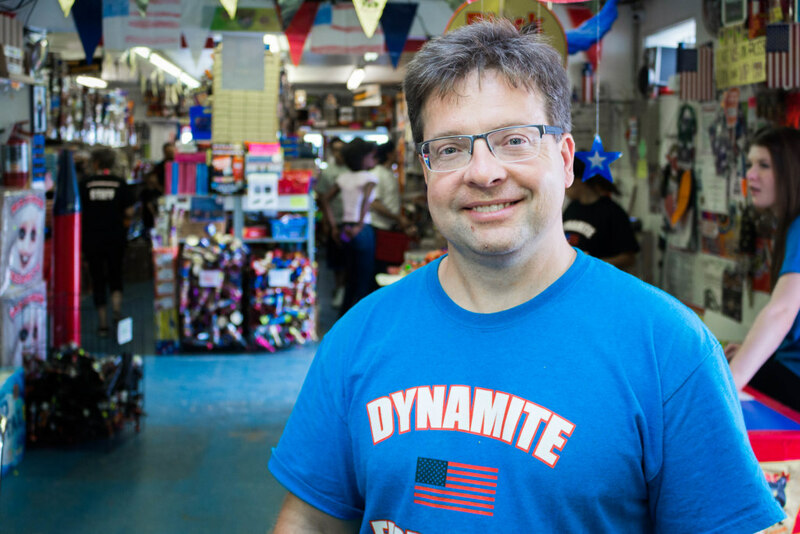 Kris Zambo, owner of Dynamite Fireworks in Hammond, Ind., said his industry has seen double-digit growth every year since Indiana reformed its fireworks laws. More than half of his customers come from Illinois. Since 2011, Kentucky, Utah, New Hampshire, Michigan, New York, Georgia and West Virginia have all lifted restrictions on the sale of most types of consumer fireworks. New York’s modest reform was estimated to generate $2 million in extra tax revenue in 2015. Talk of loosening fireworks restrictions in Illinois is often met with safety concerns. But those who oppose legalizing fireworks in the name of safety should take note that a dramatic increase in fireworks consumption and fewer restrictions in many states has not resulted in more injuries. Research from the U.S. Consumer Product Safety Commission showed no statistically significant change in people heading to the emergency room for fireworks-related injuries from 1999 to 2014. 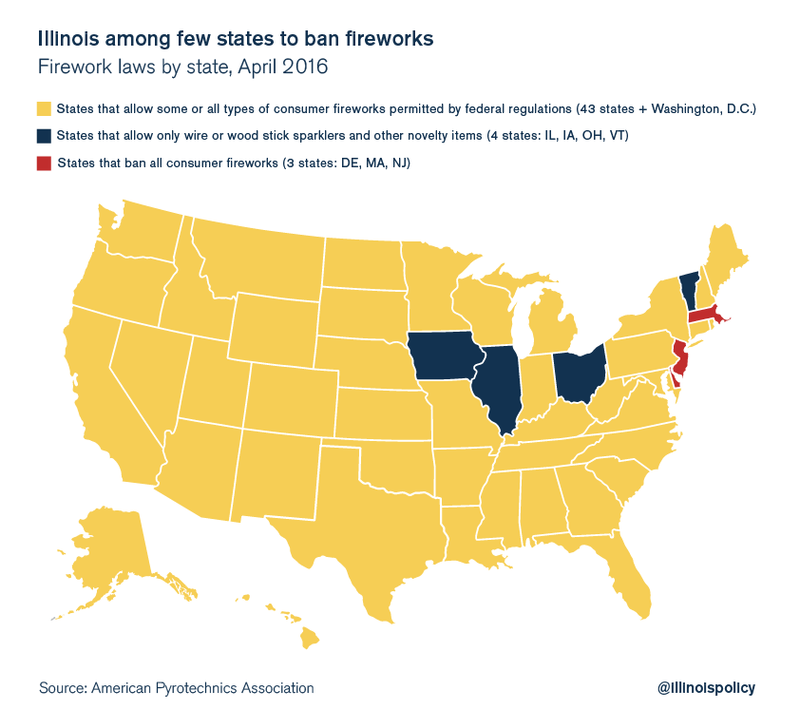 Illinois state Sen. Chapin Rose, R-Mahomet, introduced a bill in 2015 that would have legalized the fireworks currently banned under state law – and levied an additional 3.75 percent sales tax upon them. It didn’t even get a hearing in committee. Lawmakers can and should end Illinois’ paternalistic fireworks ban. The law cuts off fair access to the fruits of a huge industry. More importantly, it limits the personal freedoms long celebrated by bringing light to dark prairie skies. Kris Zambo, owner of Dynamite Fireworks, joined us on Illinois Rising to discuss Illinois’ fireworks ban. Listen to his interview.